Growing up in his father’s chemist shop in West Berlin inspired a lifetime obsession in science and research in Peter Walter. He began his studies at the Free University of Berlin before moving to Vanderbilt University as an international exchange student where he graduated (MSc 1977) in organic chemistry. He obtained his PhD in 1981 from Rockefeller University under Günter Blobel having switched from chemistry to cell biology. 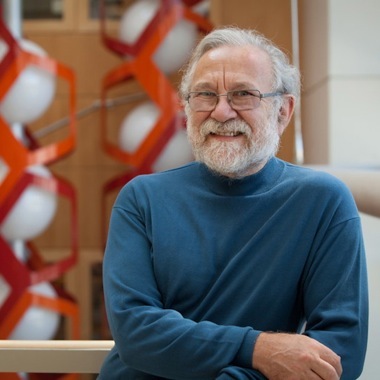 During his graduate work, he discovered the signal recognition particle, a universally conserved component that enables proteins to become properly localized in cells. In 1983, Dr Walter joined the faculty of the Department of Biochemistry and Biophysics at the University of California at San Francisco (UCSF), where he moved up through the ranks and served as Department Chair from 2001 until 2008. In his laboratory at UCSF, Dr Walter turned his attention to deciphering the pathways that cells use to regulate the abundance of their internal organelles. With a particular focus on the endoplasmic reticulum, the organelle in which many newly made proteins are assembled, his lab uncovered the “unfolded protein response”, a complex cell-internal signaling network that adjust the cell’s protein folding capacity to demand. Regulating the abundance of the endoplasmic reticulum is a fundamental process for all eukaryotic cells, and it is a key determinant for any number of diseases, including cancer, diabetes, and neurodegenerative diseases. Most disease connections arise because the cell is programmed to die, rather than putting defective and potentially harmful proteins on its surface. His lab has identified the genes that are centrally involved in the unfolded protein response and deciphered their function in this crucial cell-internal communication pathway. Since 1997, Dr Walter has been an investigator of the Howard Hughes Medical Institute and, as of 2015, a Scientific Member at the Max-Planck Institute for Biophysics. He is the 2016 President-Elect of the American Society of Cell Biology and an elected member of several prestigious scientific societies such as the German Academy of Natural Scientists Leopoldina, the US National Academy of Sciences, the American Association for Arts and Science, and the European Molecular Biology Organization. He is a co-author of the textbooks Molecular Biology of the Cell and Essential Cell Biology, two of the world's most widely used standard works in the field of molecular cell biology. Among the many awards he has received are the Eli Lilly Award in Biological Chemistry, the Passano Award, the Wiley Prize in Biomedical Sciences, the Stein & Moore Award from the Protein Society, the Gairdner Award, the EB Wilson Medal from the American Society of Cell Biology, the Otto Warburg Medal from the German Biochemical Society, the Jung Prize, the Paul Ehrlich and Ludwig Darmstaedter Prize, the Shaw Prize, the Lasker Award, the Vilcek Prize and, in 2018, the Breakthrough Prize. Also in 2018, he was elected a Fellow of the American Academy of Inventors and the National Academy of Medicine.